Lorena Hickok, Eleanor Roosevelt's devoted friend, mentor, and pioneering journalist, was born March 7, 1893, in East Troy, Wisconsin, to Addison Hickok, a buttermaker, and Anna Wiate Hickok, a dressmaker. Violence and instability characterized her early life. Her father beat Lorena and her sisters, had trouble keeping a job and forced the family to move as he sought work, thus interrupting Hickok's education as she traveled from school district to school district. She left home at fourteen to work as a maid, living with nine families in two years, until her mother's cousin Ella Ellis asked Hickok to live with her. Under Ellis's guidance, Hickok finished high school and, in 1912, enrolled in Lawrence College in Appleton, Wisconsin. Ridiculed by her classmates, Hickok never adjusted to college and flunked out after one year. The Battle Creek Evening News hired her to cover train arrivals and departures and to write personal interest stories for $7 a week. Hickok's role model, the novelist Edna Ferber, began her career as a Milwaukee reporter, so Hickok joined the staff of the Milwaukee Sentinel as its society editor, "the only position available to most women on newspapers. "(1) Bored by society assignments, Hickok convinced her editor to assign her to the city desk, where she quickly made a name for herself as a skilled interviewer. She transferred to the Minneapolis Tribune in 1917, only to move to New York City to pursue her hopes of covering World War I. Hickok had trouble adjusting to such a large city, was fired after a month, and returned to Minneapolis to rejoin the Tribune as a rewriter and enroll at the University of Minnesota. Her college education ended when she left the university after the dean tried to force her to live in the women's dormitory. Thomas J. Dillon, the Tribune's managing editor, recognized Hickok's talents, tutored her, and offered her assignments rarely given to women, including politics and sports. "The Old Man," as Hickok called Dillon, taught her the "newspaper business, how to drink and how to live. "(2) In 1928, the Associated Press hired Hickok to write feature stories for its wire service. Quickly making a name for herself by covering politics and dramatic stories like the Lindbergh baby kidnapping, Hickok surpassed her male colleagues and won the coveted right to have her name appear as a by-line atop her articles. Hickok met ER in 1932 when the reporter convinced her editors to assign her to cover ER during the 1932 presidential campaign. The two women quickly trusted one another, with ER speaking honestly about politics and social issues and confiding her fears about her life should FDR win the election. They become so close that Hickok let ER see her stories before she submitted them to her editor, and in one case, agreed to ER's request that a story be delayed. Their campaign experience led to a lifetime of devotion to one another. 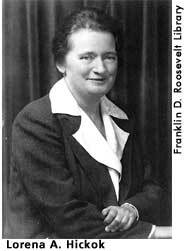 In 1933, Hickok left the Associated Press because she could no longer be objective when covering the Roosevelts. ER recommended that Harry Hopkins hire the reporter to investigate conditions average Americans confronted for the Federal Emergency Relief Administration (FERA). For three years, Hickok visited thirty-two states and provided detailed, salty reports on New Deal policy, living conditions, and politics to FDR, ER, and Hopkins. An astute, engaged observer, Hickok could assess the problems a community faced quickly after arriving and could solicit trenchant comments from locals that helped the Roosevelts and Hopkins see their policies from the citizen's point of view. Hickok also provided invaluable advice to ER as ER struggled to adjust to living in the White House. She recommended ER hold press conferences with only women reporters and encouraged her to resume her writing career, most notably ER's monthly column "Mrs. Roosevelt's Page" and her daily column "My Day," and she edited the articles ER submitted for publication. She also served as ER's trusted sounding board, especially after Louis Howe's death in 1936. Her intense concern for unemployed coal miners spurred ER's concern and played a key role in introducing ER to the West Virginia community later known as Arthurdale. In the early years of the New Deal, the two women vacationed together and Hickok accompanied ER on her official visit to Puerto Rico. When Hickok became executive secretary of the Women's Division of the Democratic National Committee (DNC) in 1940, ER invited her to live at the White House. Hickok's diabetes worsened in early 1945, forcing her to leave the DNC. In 1947, ER helped Hickok secure a job with the New York State Democratic Committee. Hickok's health continued to decline, and in 1954, a frail and partially blind Hickok moved to Hyde Park to be closer to ER. The two women collaborated on Women of Courage, a portrait of women political leaders, and ER tried to stabilize Hickok's finances. Hickok wrote Reluctant First Lady, a biography of ER, and six children's biographies before her death in 1968. American National Biography. (New York: Oxford University Press, 1999), 740. Cook, Blanche Wiesen. Eleanor Roosevelt: Volume One. New York: Viking Press, 1992. Lowitt, Richard and Maurine Beasley. One Third of A Nation: Lorena Hickok Reports from the Great Depression. Urbana: University of Illinois Press, 1981.